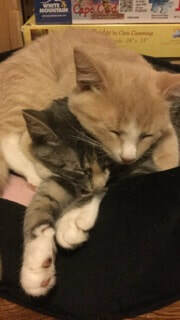 Rosie and Guildenstern came to Browncoat Cat Rescue as bottle baby orphans. They were raised with their brothers Jean Claude and Armand with a wonderful foster mother, and then had a higher calling as foster siblings. Once weaned, they were fostered with Ermitrude, who's siblings had all been murdered. Together, they taught him about wrestling, snuggling, and general kitten mischief. They get along with everyone! Rosie is beyond beautiful, and a wonderful mix of sweet and sassy. Guildenstern is a bit of a bro, and gets himself into trouble on a regular basis. Luckily, they are being adopted together, and should balance each other out!